Necromorphs are created through power of Markers (either Black Marker or its derivation Red Markers), alien object that emit a highly concentrated electromagnetic signal that alters any dead tissue in range on a cellular level, converting it into Necromorph tissue and re-animating the corpse of the host organism. This signal also affects the minds of intelligent life forms, usually manifesting as dementia and resulting in homicidal and suicidal actions – laying out a rich field of fodder for the Necromorph infection. Once some Necromorphs created, these Necromorphs would butcher any non-Necromorph lifeforms on sight so their corpses can be reanimated either via infection with their cells or Markers' powers. A Slasher: Slashers are the most common Necromorphs, posing the greatest threat when in groups. They are named for the large bone blades that emerge from the hands of their upper arms, which can be the infected corpses’ original arms or can be newly sprouted limbs. Slashers also have an atrophied set of lower arms, which usually have little purpose, but can sometimes be used to hold their prey. Bones in the feet of Slashers are extended, most notably the heel bone, which adds balance. It helps them in climbing on walls or running, but walking is harder. More durable Slashers can also result from more decayed corpses and female Slashers can spit acid projectiles. A Leaper: Leapers are more animalistic Necromorphs with more muscular arms and the top of their heads seem to have separated from the neck, also sporting a set of mandibles on their heads and mutated jaws. However, their most notable trait are their long scythe-like tails created from the corpses’ innards and legs, fused together into a single limb. Leapers’ tails can coil to about a third of its original length and they can use these to propel themselves, letting them leap long distances. Leapers also sport large fangs and claws and can move quite fast, often inhabiting areas with no gravity so as to take advantage of their fast moves. A Lurker: Lurkers are the result of the corpses of infants being transformed into Necromorphs. They have been mutated heavily, due to lacking any physiology that could be used to kill, and have become little more than a mass of muscle. Lurkers’ skin have become leathery and a set of tentacle like appendages extend from their lower stomach, which act as their primary means of movement. Lurkers attack with a trio of whippy barbed tentacles that extend from their backs and the tentacles can fire barb projectiles. An Infector: Infectors are the Necromorphs responsible for helping them to spread, constantly hunting for corpses to infect. The host corpse is twisted and broken, developing bat-like wings formed from flaps of flesh between their limbs. The head becomes the Infectors’ feelers and a stinger-like appendage, made from a fusion of bone, flesh, and spinal tissue. The Infectors’ use these appendages to spread the Necromorph infection, enveloping the corpse in their wings and driving its stinger into the skull to inject a fluid stored inside its body. A Pregnant: Pregnants sport an enormous sac that contains lesser Necromorphs and have two large arms with bone scythes. The host corpses’ arms are fused into the sac and in troublesome situations, Pregnants tear open their sacs to release the Necromorph spawn inside. They have smaller legs so as to balance themselves out and can move at a decent speed despite their bulk. The best method to kill Pregnants is avoid hitting the sac as should the sac was attacked, Swarmers inside would be released and swarm the player. Also, had a Pregnant been decapitated, they would wind up slashing everything around them blindly, which is useful should this Necromorph also be accompanied by another. A group Of Swarmers: Swarmers are small Necromorphs that seem to be nothing more than reanimated chunks of flesh. They attack in groups and try to swarm and overwhelm their targets, tearing them apart. A Exploder: Exploders are suicide bomber-esque Necromorphs with large glowing growths on their arms that are extremely explosive. The corpse hosts of these Necromorphs have had their heads split in half and they can use these two halves to bite at enemies. Exploders’ other arms and legs have developed to help balance them out, so they can manage a clumsy walk. When they have gotten close to enemies. Exploders swing the explosive pustules on their arms at them or against the ground. This results in a large explosion, which can easily blow humans to bits and usually kills the Exploder. A Divider: Dividers are tall, lanky Necromorphs, able to split apart into smaller Necromorphs after they have been damaged enough. These Divider spawns are not as durable as the original Divider, but they are very fast. They move along with tentacles and jump onto and attack their enemies. A Hunter: The Hunter is a unique Necromorph created by Dr. Challus Mercer which was created by placing some of the Corruption’s tissue inside a human. It is built similarly to the Slasher, but bigger and stronger and can regenerate lost limbs, meaning that the dismemberment method used on other Necromorphs will only stop the Hunter temporarily. 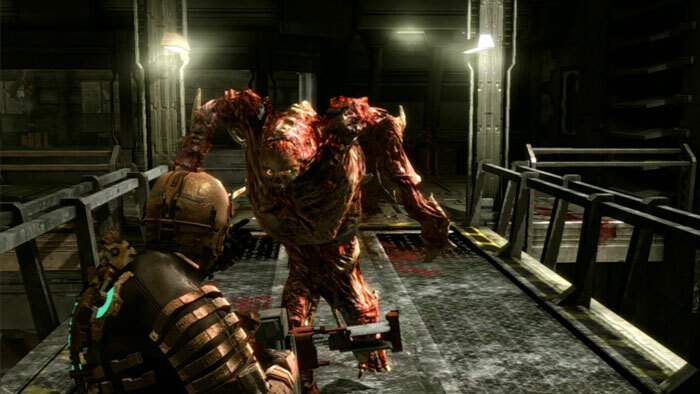 The Hunter pursued Isaac Clarke throughout the USG Ishimura and he was only able to escape it or temporarily disable it on each occasion. However, he was finally able to wipe the Hunter out when he test fired the engine of a shuttle while it was in the way, incinerating it completely. Both would be terrifying but I think I'd choose to fight through necromorph as they atleast can't use guns. There's many different flood variants as well though. If Flood couldn't use weapons I think I'd choose them but that's really the deciding factor here for me. Flood infect WAAAAAY easier. But that won't stop me. Dying from the Flood is by far cooler! Flood outbreak. Standing with a group of people fighting off all the little infection forms that go "pop" every time you hit them would be immensely satisfying like popping bubble wrap. One awesome feeling before you'd die. Flood, just make sure to burn my body. Valhalla awaits! I have thought that several times over the years and I have never been able to decide, both are just over the point where it matters when thinking about survivability and minimizing the chances of gruesome death or even slow assimilation. I'd rather fight the flood. Both are horrifying but necromorphs look like they're from Silent Hill. No thanks! Also... I want to be in the Halo universe so badly. That sounds messed up, but I really want to go to beautiful worlds before dying. Both would be pretty scary. I think I'd go with Flood because they're easier to put down with standard weaponry. I feel like I've prepared more for a fight with the flood even though I'm screwed either way. Necromorph's are somehow even more terrifying than the flood, so they get a hard pass from me dawg. Flood doesn't seem so bad. I mean all I have to do to kill them is activate the holy rings, and carve a path into the divine beyond.